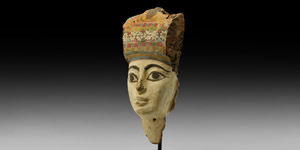 A wooden face mask with painted detailing to the eyes and brow, headdress with bands of polychrome rosettes, sacred scarab and other floral detailing; mounted on a custom-made stand. 920 grams total, 37cm including stand (14 1/2"). Fine condition. Formerly in an important central London collection; previously acquired before 1990. See Walker, S. & Bierbrier, M. Ancient Faces. Mummy Portraits from Roman Egypt, London, 1997 for discussion.